Jane Taeger, Shapiro Director of Compliance, warns importers of the dangers of improper ISF filing. The Importer Security Filing (ISF) began in January 2009 with a one-year introductory phase-in period. Full enforcement began in January 2010, but Customs and Border Protection (CBP) maintained a flexible and measured enforcement stance. Penalty guidelines were published in July 2009, but Customs held off doing anything until July 2013 when they announced they would begin full enforcement for real and start issuing liquidated damages against ISF importers and carriers for non-compliance. Liquidated damages (essentially penalties backed up by a Customs bond) are being issued, but the ports must submit the cases to CBP for review first. This will be the procedure at least until mid-2014. HQ has rejected multiple cases from the ports, but has issued penalties against egregious ISF offenders. Liquidated damages for ISF start at $5000 for failure to file an ISF; $5000 for late ISF; $5000 for inaccurate ISF; $5000 for an incomplete ISF; and $5000 for failure to withdraw an ISF. The maximum liquidated damages per ISF filing is $10,000. Don’t wait until the last minute: ISF must be filed at least 24 hours prior to vessel departure. File the ISF as soon as you are able. Make sure to get the information to the filer no later than 72 hours prior to sailing. This will allow time for holidays and weekends. Use a template: Save time and reduce your likelihood for errors by using a template. If you don’t have one, use our Import Security Filing ISF Template. Hold your suppliers responsible: Build language into your vendor manuals, purchase orders, contracts, letters of credit, etc., with your ISF expectations to hold your suppliers accountable for providing the ISF data and providing it timely. If you receive a penalty for a late ISF, make sure you have a clause that will require the supplier to take responsibility for the cost if they are at fault. Use a continuous bond: A Customs continuous entry bond will cover both the ISF and the Customs entry. If you do not have a continuous bond, you will need a separate ISF bond for each filing. If the ISF is late, the surety company will likely ask for collateral of $5000 to secure the bond. Need a continuous bond? Contact us. Don’t be afraid to amend your ISF filing: Update the ISF if you need to amend any information. Do not sacrifice a timely ISF by deleting it and refiling late. ISFs can be updated at any point up to the time the cargo arrives in the U.S.
Get a bill of lading (B/L) match: Make sure you get a bill of lading match at least 24 hours prior to cargo arrival. If you get an “AMS Bill Not on File” message, do not resend the ISF to try to force a match. Do double-check the bill of lading number to be sure it is correct and is the lowest level bill number on file in Automated Manifest System (AMS). If it is, the match will occur once the carrier files the manifest. If the vessel sails and a couple of days later you still don’t have a match, then you should contact your supplier to verify the bill of lading information. Monitor your monthly ISF progress report: The party filing your ISF receives these reports through their Automated Commercial Environment (ACE) portal and should be forwarding them to you. The reports detail the number and types of errors occurring as well as your ISF on time percentage. For more information on ISF, download What You Need to Know About Importer Security Filing (ISF). Need Help with Importer Security Filings? Shapiro’s experience in managing ISF programs is your lifeline for ISF compliance. Click the buttons below to request more information. May i ask you? I just realized, i sent ISF on 5 oct which mother vessel departured on 3oct. It will be any pinalties from us custom for late submission? While our AMS status already MATCHED. Late penalties for late ISF filings can range from $5,000 for the first infraction to $10,000 for each additional late filing. While CBPs enforcement of late/unfiled entries is still inconsistent, the grace period for penalties has passed. If your AMS status is MATCHED, you will have to wait until the shipment arrives if any penalties will be assessed. I’m later with ISF filling about 4 days, Please advise any steps or company could help to sort this out with min penalty. Sorry to hear about your late ISF filing. We advise that you contact your broker immediately to have them file the ISF, if you have not already done so. Unfiled or late filed ISF’s get flagged for hold if not filed properly but at this time, we are unsure if a penalty will occur, but moving forward, we recommend that you make the necessary changes to your supply chain to ensure that your ISFs are filed timely. Please let us know if you need anything at all. I’m engaged in a NVOCC company, I found out I was a little bit late for filing ISF, the container on board time was 11 Dec. 21:00, but the ISF matched time was 11 Dec. 8:13 a.m., and I got 1y message on 10 Dec.20:57. Really anxious about the $5000 penalty will be assessed… Is there any way to know in advance if I’ll be charged? How long will we receive the bill after the US custom decides to make the fine happen? Thank you for your reply. The actual ruling states that ISF must be filed 48 hours before the shipment is on the final vessel to the U.S. With that in mind, you can email your freight forwarder to confirm if the shipment is transshipping or not, first. In addition, you are also only a few hours behind the ‘cut-off’ time so I don’t think your shipment will receive the penalty as it is being assessed against more egregious offenders. Just note that your shipment may receive an examination upon arriving to the U.S.
We hope this helps and wish you the best of holidays! How you doing , , can i do my ISF by myself , and in case is yes ,, i would like to go to any office you guys have to check if i fill it in the write way , thanks i appreciate your help. While importers can choose to file their own ISF, it is very important that you understand what information is required so the ISF can be filed correctly and timely. We handle ISF filings for many of our customers, but we cannot offer the service of checking to ensure your ISF is correct. We recommend that you enlist the assistance of a customs broker to assist with the filing process if you are unsure about the accuracy. Regarding the late filing penalties , Does it matter if the cargo total value is $1000 or $100,000 ? 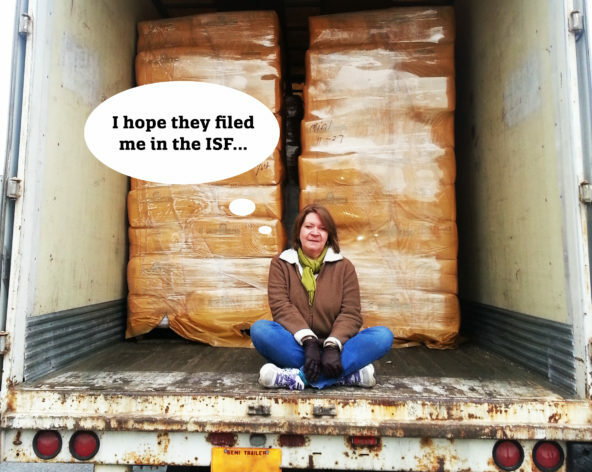 I am filing ISF today and the shipment is leaving today itself. We’re sorry to hear about the late ISF filing for your shipment. The dollar value of the goods does not matter since any ocean import shipment is required to have the ISF filed 24-72 hours prior to the vessel departure. You may not end up with any penalties for the late filing, but we would recommend that you contact your customs broker immediately for more information. We have a broker we go thru to submit our ISF forms to customs for matches. If the information we send them on original does not match when they send back to us their copy of ISF sent to customs: ex(ship to party, consolidator or selling party) is this an issue with customs? Doesn’t all the information have to match for the arrival and pick up at port? The information that is needed to file ISF properly must match what is listed on the original shipping documents. If the information is incorrect, you may experience issues with exams in the future if it is caught by Customs. We recommend that contact your broker and supplier to ensure that the information filed for ISF matches so you remain compliant with Customs. For ISF filling, if the information was wrong such as vessel, container no. seal no. so ISF still complete with filling? The information filled for ISF must reflect the correct information on the shipment. If there are discrepancies, even though the ISF was filled on time, the probability of the shipment being flagged for exam will be higher. We recommend that you work with your supplier and customs broker to ensure the ISF information being filed is correct. hi, is penalty is real for late filing? this is my first time our isf filed late. The penalty for ISF is not something to be taken lightly. Customs has been less tolerant of late ISF filings over the past year, but you may not be fined this time. We recommend that you contact your broker immediately to ensure everything has been filed correctly and also set up protocols to remain compliant with CBP standards moving forward. I sent an ISF after 4 days the sailing date (shipment sailed on 13th November 2016 – I sent ISF only on 17th November 2016 and it was filed the same day by the broker). AMS wasn’t done by us (NVOCC) but directly by shipping line. Now shipment has arrived at POD and container already returned empty at POD terminal (Houston) on 15th December 2016. Can you please assure me that there won’t be penalties on our account? I’m really worried and I want to be sure. Thank you for your kind reply and Merry Christmas! You will be notified by CBP is there is a fine associated with the late ISF filing. We recommend that you contact your broker to ensure your future ISFs are filed timely and accurately to avoid issues like this one. Your broker may also be able to let you know if this particular ISF filing involved a penalty. I had FedEx trade networks file my ISF 3 days prior to the departure of my vessel however my supplier notified me that FedEx trade network never filed. The shipment has now set sail and I ended up asking my supplier overseas to file ISF for me (on the same day as departure). I’m extremely worried about the fine. Is there any way I can find out if I will get a fine? And if I do end up getting a fine, what can I do to explain the situation to the CBP? We recommend that you verify with the supplier that the ISF was indeed filed prior to the vessel sailing. You can also contact your Customs broker to ensure they have not received any notifications on the possible late ISF filing. Good luck in obtaining this information and we hope that no penalties occur! 3 days / 72 hours before vessel entering transhipment port which now in my case vessel had transit at Shanghai port on 28/May. Now we rcvd notice from US agent that possibility will have penalty due to late ISF filled. Hi! Pls advice me that who can be filed AMS? Thanks for reaching out to Shapiro! The Automated Manifest System (AMS) is used only for the processing of electronic manifests and must be filed at least 24 hours prior to the cargo arrival. Your customs broker or freight forwarder can file AMS on your behalf. The official rule states that ISF must be filed and accepted 24-72 hours before the shipment leaves the last port for transit to the U.S. As long as ISF was filed, it can be updated to reflect the correct information. We suggest you obtain the full final routing information for the shipment as well as the ISF submission confirmation from ACE. I have included links below to showcase how you can create and ACE Portal account as well as how to access your ISF filing information. If you believe that the issues were caused by you forwarder or the carrier and you cannot resolve the situation, you can call the general CBP Client Representative number at 571-468-5500. We hope you can get the situation resolved without having to pay any penalties. If I have a continuous bond, will I still get fined if my ISF is filed after the vessel has sailed? You could still be fined for a late ISF filing even if you have a continuous bond. We recommend that you contact your broker to have the ISF filed immediately. Your broker may also be able to tell you if you were penalized for the late filing. Your customs broker/forwarder may charge for amending the ISF, but you will need to contact them directly to determine if there are any applicable fees. Good luck updating the ISF information! great article/blog! I was wondering if the fine is assessed immediately and if US Customs issues a receipt for it. I have a bad vibe from the actions of my Customs broker in Houston. My broker charged me the $5K saying the shipment´s ISF filing was not done in time by the shipper´s freight forwarder (DSV) in Europe, but claims he has no receipt to prove the amount he charged me was paid. How can i see if the amount was paid in my behalf and avoid being shown a receipt down the road issued for some other party and placed in my expense account to justify. Am I getting ripped off? We’re sorry to hear about the issue you are facing. If the ISF was filed late, a penalty notice would be issued by Customs with the amount of the fine. The proof that the check cleared the bank account of the company paying would be the receipt. If the penalty is not paid, the importer would be placed on National Sanctions and they would have to pay all duties up front. We recommend that you contact your broker for proof that Customs has indeed penalized your company for the late ISF. Thank you for your time and answer. Problem is the broker (whom we sent the fine monies to) claims the “penalty notice” will be issued 6-8 months after the payment, basically they want me to take their word as to the fine being paid on my behalf. Considering DSV (contracted by the supplier who’s at fault for not having done the paperwork on time, them being the consignee on the Master BL) claims they were able to contact the authorities and have them waive the fine for it being the first time, but also has not provided me with proof of the waiver… i am basically stuck between two incompetent and possibly fraudulent parties holding the short stick, and no way to prove my supplier of the screw up and recoup any funds. My terms were CIF Laredo, the container went thru Houston exactly when Maersk´s was hit by ransomware, and disappeared from the radar for almost 2 months, exposing the contents to the extreme heat and humidity at port, finally damaging the goods! What a mess! My cargo LCL sailed 12 days ago and we just realized the ISF was not filed. We are working on getting this filed now. What’s going to happen now ? We import on regular basis and this our first time being in this situation. Penalties for late ISF filings can range from $5,000 for the first infraction to $10,000 for each additional late filing. Though there was a grace period, it has now passed and we are in an era of strict enforcement. This does not mean that you will be fined for certain, but you will have to wait to hear from your broker as they will be the first to receive notice of late filing and any associated penalties. Is your cargo routed straight to the destination port in the U.S., or will it transship? If there is a transshipment port and ISF is filed 24 hours before your goods depart from the transshipment port to their final destination, then your ISF was filed on time and there will be no penalties assessed. Best of luck and please let us know if you have any further questions. Hello, This was very helpful. I was new to importing and didn’t understand what the email with simply ISF meant, didn’t help it was mostly in Chinese. Now it is 4 days out and no custom agent can help me file it. What options do I have. The shipment was $660 worth of material. The $5K makes me feel ill.
We’re sorry to hear about the issues with your ISF filing. We recommend that you determine what Incoterm was used when you purchased the goods from your supplier. We have included a link to our resource below. You should also contact your customs broker immediately to file the ISF. It is possible that you may not be penalized. Good luck and we wish you the best in this situation! I confused one thing: How did you know about carrier filling AMS’s time? when I filed AMS for our HBL, If status is 1Y, it means carrier already filed AMS, right? If 3z, it means ISF was done? U.S. CBP requires that AMS be filed before cargo departs its origin country. Failure to transmit AMS prior to departure can lead to penalties, though we have seen these waived before in certain instances. Your best bet is to file AMS as soon as possible. Thank you for reaching out to Shapiro. 1Y and 3Z are each disposition codes used by CBP to denote automated manifest requirements. 1Y is generated when the SCAC and bill number transmitted match that of the contract carrier, so this would identify that a bill of lading has been manifested properly. 3Z is generated if there is an ISF on file for the bill of lading, so this indicates that the ISF was sent and is matching what’s on file. We hope this information is helpful! Please don’t hesitate to reach out with any further questions. We’ve shipped 1 container from India to San Juan, Puerto Rico on 09-Sep-18 and later realized that US ISF filing rules also apply to PR as it falls under US CBP territory. We are in process of filing ISF on 21-Sep-18. However it is also noted that the vessel & voyage will be changed twice in-transit before it finally arrives PR. Would it still attract late filing penalty? Thank you for reading our blog and indeed, ISF rules also apply in Puerto Rico. ISF only needs to be filed prior to departure from the final port before reaching Puerto Rico. Thus, as long as you file ISF prior to your cargo’s departure from the second transshipment point, then you should not incur any penalties. Best of luck and please don’t hesitate to reach out with any further questions. We have shipment from Indonesia to Oakland, vessel departure from Indonesia (Semarang) Oct 11, 2018 and connecting vessel from Singapore to Oakland is on Oct 24, 2018. We just submit ISF on Oct 13, 2018 to customs. Could you please check whether this OK or any penalty for this? For submit ISF is counting 48 hours prior vessel sailing date, mean of vessel is mother vessel to USA or feeder vessel (vessel from POL to transhipment port example Singapore) Please advise, thx. When utilizing a transshipment port, ISF only needs to be filed 48 hours prior to departure from the transshipment port. Thus, it appears you filed in plenty of time for the above shipment. Please don’t hesitate to reach out if we can ever be of any assistance. We sent the ISF to our broker but, due to an internal server problem, they didnt received the ISF. The vessel arrived yesterday and today is when we realized that happened. They already received the documentation and are working on it. How much do you think is going to be the penalty. Thank you for reaching out to us! Penalties can run up to $5,000 (US) in this case. However, it varies based on your situation. Best of luck and please don’t hesitate to reach out with any further questions. with contracted shipping line scac code and ISF also filled – 3z code receive but 1Y code not generated. And so far contracted line has not filled the master bill of lading and if contracted line file the AMS prior 5 hours of vessel sailing or filled after vessel sailing then custom penalty will be applicable and who will be held responsible for late filling since being customer had filed HBL AMS n ISF well on time. Please help to understand who will be responsible if contracted line file AMS MBL LATE. The AMS will always be filed by the carrier at the time of vessel departure and not before. There is a possibility that the reason behind a late AMS filing has something to do with inaccuracies/issues with the House Bill that was presented to the carrier. We see late filings quite often, and most likely the carrier is late filing their AMS details, or the cargo is a transshipment. If this causes the ISF to be late and results in fines we would recommend disputing it, by utilizing your data and filing records. This would include AMS notes, ISF transmission and any issues from the carrier’s negligence. Hopefully, you would get the penalty mitigated. We hope this helps. Please don’t hesitate to contact us if you have further questions about your shipment! Thank you for reaching out to Shapiro! A $5000 penalty is standard for failing to file an ISF on time. The importer is likely asking that you (as the seller) pay these fees if you were the party responsible for filing the ISF with Customs. Penalties can be mitigated with CBP on a case by case basis. In order to determine your level of liability, we would need more information from you. Please reach out to web@shapiro.com if you have additional questions. Thanks! Who can assist to file a Late AMS for HBL? Thank you for contacting Shapiro. Whoever is handling your shipment is the party responsible for filing this paperwork. Good luck and let us know if you need additional assistance on late filing procedures. Thank you! I have 3 shipments which were filed ISF before vessel departure 2 days. After shipper canceled and did not loaded. And I cancel AMS, but forgot to cancel ISFs. After ATA 2 days, I found out them and canceled. Have any penalties for this case? Thank you for contacting Shapiro. Failure to withdraw ISF can result in a penalty of up to $5,000 per shipment. However, because you canceled the AMS in advance, we recommend contacting customs directly to determine if you are able to avoid these charges. Good luck! With the new March 15 2019 implementations of late ISF 5 penalties . Who will customs be going after for the fines? Shipping Line, Forwarder, or importer ? We are a freight forwarder and this was a direct vessel US with ETD 25th March and the ISF and AMS was submitted on the same day. kindly advise if there will be any penalties. We received the 1Y mail for the AMS submitted. Thank you for contacting Shapiro! Our Importers Beware – ISF-5 Enforcements are Coming Shap Flash provides further insight into CBP’s current ISF-5 enforcement and penalty guidelines. Good luck! Thanks for contacting Shapiro! In order to have a timely ISF, shippers must have it filed no later than 24 hours before vessel departure. This is modeled after the 24-Hour Manifest Rule enforcement standard. CBP uses the first bill of lading file date as a “proxy indicator” of ISF timeliness since the bill of lading must also be filed at least 24 hours prior to loading vessels. CBP is now using the vessel departure date minus 24 hours to better assess ISF timeliness. Therefore, your shipment may be subject to penalties if the ISF was filed on the same date of its departure. Best of luck!